The fifth wedding anniversary of The Queen and The Duke of Edinburgh was in 1952, the year she took the throne. As an anniversary gift, The Duke commissioned from Boucheron a bracelet of his own design, made from gold, platinum, diamonds, rubies, and sapphires. Philip's design includes his naval badge in the center with a diamond-set anchor, two roses set with diamonds and accented by rubies, two crosses of sapphires and a single diamond, one cross of rubies and a single diamond, and gold links designed as intertwined "E" and "P" letters. 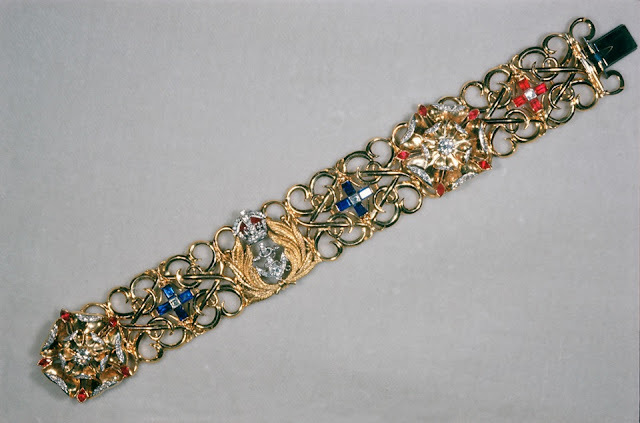 Occasions on which The Queen has worn this bracelet in public are rare, but she did appear to wear it during the celebrations marking their 60th wedding anniversary in 2007, at a family dinner hosted at Clarence House by The Prince of Wales and The Duchess of Cornwall. 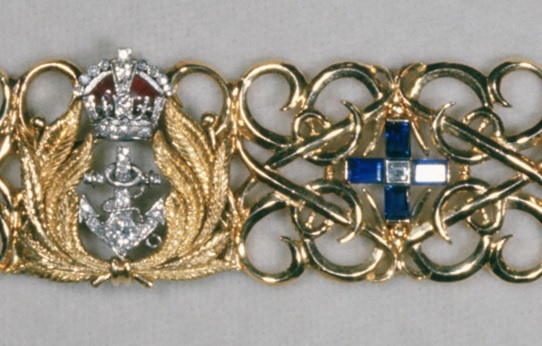 The bracelet has also been displayed, and was included in an exhibition celebrating The Duke of Edinburgh's 90th birthday.